1. Film drawing down system controlled by servo motor. 2. Automatic film rectifying deviation function. 3. Various alarm system to reduce waste. 4. It can complete feeding, measuring, filling, sealing, date printing, charging (exhausting), counting, finished product delivery when it equips with feeding and measuring equipment. 5. The way of bag making: The machine can make pillow-type bag and standing-bevel bag, punch bag or according to customer’s requirements. 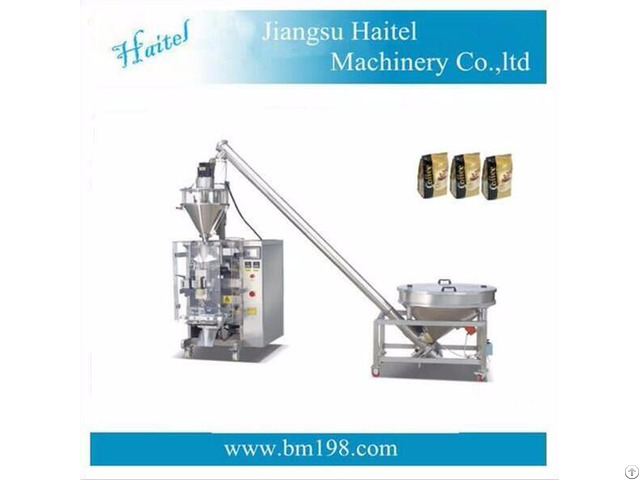 It is suitable for packing of several of granule, powder, such as sugar, salt, coffee, etc. Packing speed About 30-60 bags/min. It is according to quality of wrapping film and materials. Voltage (V) Four wires, three phases, 380V, 50Hz. This type can do measuring and filling work. Due to the special design, so it fits more to the fluidic or low-fluidity materials, like milk powder, Albumen powder, solid drink, white sugar, dextrose, coffee powder, fodder, pharmaceuticals, agriculture pesticide, granular additive, dyestuff, and so on. The hopper could be washed easily without tools. Include handwheel of adjustable height. The Machine can convey sorts of material. Combined with the package-machine of our company, it can do material situation tracing. Also it can be used separately. Complete machine made in stainless steel, except for the electrical machine, gearing, and the framework. 1) Vibrating screw feeding machine is composed of double motor, feeding motor, vibrating motor and each switch control. 2) Hopper is adjustable and vibrational which make material to be flowing easily. It is good to material. 3) Hopper is separate from twisting shaft. Structure is reasonable and easily loading and unloading. 4) Characteristic dustproof, bearing won't be polluted by the dust and powder. 5) To cleanup scrapped materials conveniently and design the machine to be: Discharging the material reversely, storing materials at the bottom of hopper pipe, and taking out the whole screw. The machine can send the packed finished bag to after-package detecting device or packing platform.